314 pages | 7 B/W Illus. China's historic accession to the World Trade Organization (WTO) in November 2001 not only represents an important milestone in the country’s transition to a market economy and integration into the global economy, but is also among the most important events in the history of the WTO and the multilateral trading system. China and Global Trade Governance: China's First Decade in the World Trade Organization provides us with some fresh empirical data to assess the country’s behaviour in the liberal international economic regime. Such an assessment is both timely and necessary as it can help us better understand China’s role in the evolving structure of global economic governance, in addition to shedding light on the broader debate about the implications of the rise of China for the international system. 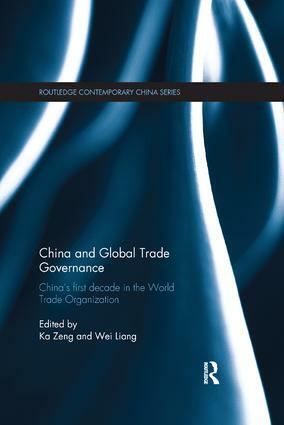 Through a thorough examination of China’s WTO compliance record and its experience in multilateral trade negotiations, this book seeks to better understand the sources of constraints on China’s behaviour in the multilateral trade institution as well as the country’s influence on the efficacy of the World Trade Organization. In doing so, this project speaks directly to the following questions raised by China’s unprecedented ascent in the international system: Is China a rule maker, rule follower, or rule breaker in international regimes? Is Beijing a responsible stakeholder capable of making positive contributions to global trade governance in the long-term? Ka Zeng is Professor of Political Science and Director of Asian Studies at the University of Arkansas, USA. Wei Liang is Associate Professor in the School of International Policy Management at the Monterey Institute of International Studies, USA.